Jeffrey Lee Pierce in bona fide rock’n’roll tradition, was destined never to grow old. He barely gave himself a chance. The first diagnosis of cirrhosis of the liver may well have been as early as 1982. Pierce was a mere 24 years old then, two thirds of the way through his brief earthly sojourn. That he lasted as long as he did surprised some, but his death in 1996 (from a brain haemorrhage) still came as a shock to many. The Gun Club had made a career out of being the craziest, drunkest, most shambolic act on the LA scene. The band members played their parts willingly. After all, as Pierce said at the time: “People here have got nothing else to do but lose their minds.” Who better than Jeffrey to help them on their way? When Pierce – who ran Blondie’s West Coast fan club – met Brian Tristan (Kid Congo Powers) – chief of The Ramones fan club – at a Pere Ubu gig in 1978, sparks were destined to fly. First baptised Creeping Ritual and soon after The Gun Club, this early incarnation were according to Powers “too arty for rock people, far too rock for arty people, too cuckoo for the blues crowd and too American for punk”. If history was theirs to make, it was near inevitable that their legendary status would be born of their scabrous and uncultivated live performances and their antagonistic personalities, rather than from their mercurial discography. The Gun Club would never neatly present us with a ‘Forever Changes’ or a ‘Marquee Moon’; their anarchic lifestyles possessed neither the patience nor prissiness for that to happen. By rights there should be no place on this list for their second LP ‘Miami‘. Gun Club devotees, accustomed to the band’s cathartic early performances, lament the emasculated mix of an album which in the right hands, could have been a career defining, even generation defining moment. It wasn’t. A critical and commercial failure, it lacks the blood and guts of their debut ‘Fire Of Love’, the nocturnal glare of ‘The Las Vegas Story’ (Pierce’s personal favourite) and the polish and swagger of ‘Mother Juno’. At least the latter pair provided the most unpunctual of platforms for original member Kid Congo Powers, absent from the band’s early records on Cramps duty, and ‘Miami’ doesn’t feature him either. Powers’ replacement, Ward Dotson who plays guitar, called the album disastrous. In an interview during the twilight of his career, Pierce was congratulated for delivering such a fine album, and proceeded to mercilessly deride the journalist’s compliment. So, is its inclusion here an act of folly or simply sheer contrariness? Not so. 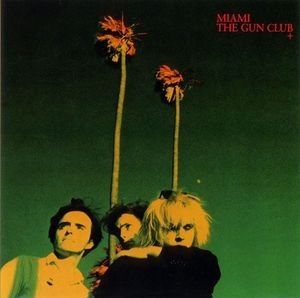 We’ve included it here for one very simple reason – more than any other of their albums, it has the highest concentration of brilliant Gun Club moments. Chris Stein’s anaemic production? Yeah, I hear you. Blah blah blah… You want the best post-punk collection of primitive American rock’n’roll songs? Look no further. ‘Carry Me Home’ and ‘Like Calling Up Thunder’ showcase Pierce’s shrill atonal wailing which almost drowns out Dotson’s atmospheric slide guitar, the latter track also featuring a brilliant rumbling Fall-like rockabilly rhythm. ‘Brother And Sister’ opens up promisingly (‘Sins of me, buzz and hiss in the trees/Their little skeletons will harm no one/Why do you bring them, always back to me/Their kingdom come and their will be done/On Heaven and earth and me’) but ends up feeling a little stiff and contrived. Thankfully it is followed quickly by a sizzling cover of Creedence’s ‘Run Through The Jungle’ – here Pierce multi-tasks with a strung out lead guitar, all the while sounding like he’s performing a frenzied shamanic ritual. But the album hits ramming speed on ‘Devil In The Woods’ which along with Side Two’s ‘Bad Indian’ and ‘Sleeping In Blood City’ shares the thrilling two chord frenzy of ‘I Wanna Be Your Dog’ filtered through an exhilarating psychobilly spectrum. Bassist Rob Ritter alongside Dotson play with finger-shredding ferocity which even the flattened mix can’t disguise. Pierce’s delirious and savage delivery ensures these are three songs to make cacti bleed. Meanwhile the band give good range on ‘Texas Serenade’ where once again Pierce maniacal delivery is electrifying, this time strewn wildly over Mark Tomeo’s woozy steel pedal. ‘Watermelon Man’ is the bands very own ‘Walk On Gilded Splinters’, conjuring images of blood spattered Creole dolls – one can almost hear the bells jangling out their rhythm on Pierce’s wrists. If the band’s take on the standard ‘John Hardy’ is an archetype for the cowpunk of early Meat Puppets, nevertheless I somehow find myself singing along to Roxy Music’s ‘Editions of You’ – which despite its futuristic aspirations shares with it the same basic blues roots. Meantime, ‘The Fire Of Love’ out-Cramps Lux and Ivy with a big proud garage stomp. The closer ‘Mother Of Earth’ is almost a straightforward country rock track (once again enhanced by Tomeo’s steel pedal cameo), but masterfully evocative of the wide open desert spaces and consequently a fitting finale to an album which couldn’t have been made anywhere else in the world or by any other band in the world.